Hey guys today I'm going to be reviewing these two amazing products. 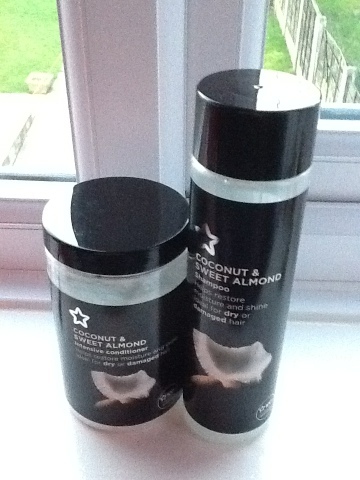 They are such good quality, both products smell amazing.although if you don't like coconut you'll probably hate it!!! So lets start with the shampoo this is meant to help restore moisture and shine. After using this for a couple of weeks my hair is feeling less brittle and a lot less damaged, on the shine front I'm not to sure I can't say I've seen a huge improvement. Onto the conditioner this little pot is liquid Gold it's AMAZING ! I use it once a week and the obvious results last about two days. It makes hair super shiny and lovely and light I've found after using these two products my hair is soooo much healthier and at 0.99p for the shampoo and £1.49 for the conditioner it's such a steal. I can't wait to try out there range for coloured hair!!! posts like this make me wish we had a superdrug! I'd love to try that conditioner. I've never actually tried any of the superdrug range, but I'm dying to after reading this, sounds great!